HomeBiodiversityThe Value of BioBlitz: My First Experience at Bluff Nature Reserve, South Durban. Interesting way to get around… Me in a dilapidated canoe holding by-catch sharp-tooth catfish alongside my friend and colleague Camille Fritsch. A day or two before flying back to Durban I received an email from a colleague inviting me along to a Bioblitz from the 2nd to the 5th of September in Bluff Nature Reserve. I knew that when I got back the vast majority of my time would be spent in offices and laboratories, so I immediately agreed to get out into the field. I find all conservation scientists, no matter their focus, really need to get out and get their hands dirty as a strange form of meditation and also to remind us about what we’re trying to understand and protect. 1) What is the Bluff Nature Reserve BioBlitz? Once I agreed to partake as a herpetologist, I found out more about these new BioBlitz’s, which the university and their partners have organised (2 more are scheduled later this year). Generally speaking, BioBlitz’s are intense biological surveys, the goal of which are to document every living species within the survey area. 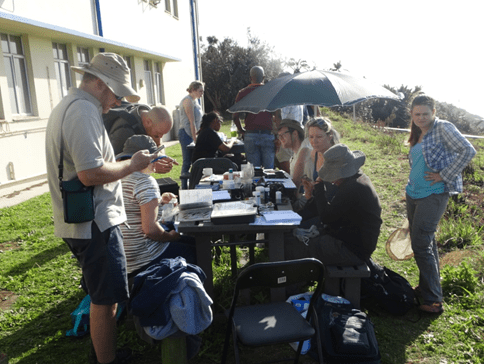 This BioBlitz also had the aim of establishing a new “community of practice (CoP)” in KwaZulu-Natal (KZN); building better ties between academics, students and government officials. It is well known that universities often have advanced research methodologies and other scientific capabilities, but are not always well connected with problems faced by the State, while government agencies often have to address these problems with severely reduced research capacity. The idea behind these 3 BioBlitz’s is to bring academics, students and government officials together to work on biodiversity-related problems of mutual interest and to share each other’s knowledge and skills. This is intended to give students exposure to issues of the workplace and to give researchers and managers the opportunity to share concerns and research methodologies, and to develop student projects that could provide useful data for management of protected areas. In consultation with the eThekwini municipality (Durban city municipality) and Ezemvelo KZN Wildlife (the KZN version of the national parks and wildlife service), these BioBlitz will bring together various experts as well as people who are simply keen to learn, while also generating useful biodiversity data for each area being targeted. Sites have been selected to generate data for previously under-sampled areas, which are consequently valuable to the eThekwini municipality and Ezemvelo KZN Wildlife. With all of that in mind I was keen to get out and get as many species as possible! I was also keen to share my interest in reptiles and amphibians with others, while simultaneously learning from those who are passionate for different taxonomic groups and different aspects of ecology. Within Bluff Nature Reserve was a large pan (lake). I’d brought along 6 terrapin traps I had made for my data collection for my PhD and was keen to stick them out in this pan. I was told of historical records of marsh terrapin but also of another species less studied, known as Pelusios rhodesianus, or the Mashona hinged terrapin. Either of these would be an excellent find as the records are very old and the Bluff is surrounded by dense urban expansion from the city of Durban. When I made it to the pan to say it wasn’t the most terrapin friendly water body was putting it mildly. All the banks were surrounded by thick growth of invasive, non-native bulrushes and just beyond them were thick mats of invasive alien parrots feather (aquatic vegetation). We were also told by members of the eThekwini municipality who were joining us on the Bioblitz that two alien fish species had been introduced. Although negative, this was valuable information from local conservation professionals. Another piece of information that we learnt was that the pan was practically reduced to a puddle in size, during a drought in 2015. The aquatic plant invasion was so strong that I only had one access point to the water, which was under a bird-hide, where I found an abandoned old canoe. This made the experience of getting out and setting up the traps even more fun and at times a bit nerve-racking, as it leaked whenever I went out, making each trip a race against time! 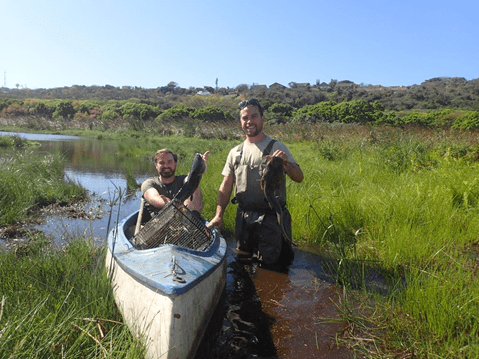 In the end no terrapins were caught, but as I always say: no data is still data. We did get a few sharp toothed catfish, a native species of fish which were added to our species list. That’s not to say there might be a very small remnant population of terrapins just hanging on, but if there is they are just surviving, not thriving. and creating more suitable nesting locations. Tables set up for the processing of data (mainly biomorphometric) from the mist nets for birds and small mammal traps for rodents. Whilst I was out in the pan getting soaked, mud caked and smelling of catfish and chicken livers (terrapin trap bait), other colleagues and researchers were working hard, bird ringing, setting up camera traps for small carnivores and other mammals and setting mammal traps for different rodent species. In our group, we had a bat expert, a mollusc expert, two entomologists from the Durban natural history museum, as well as the insect-plant interactions group from the university. So within 3 days a vast array of data was collected. The great thing about these BioBlitz’s are the interaction between different experts from different areas. In the 3 days I learnt a lot more than I’d expected to learn about the different species and behaviours of snails and millipedes, for example. As well as learning about bio-acoustic software being used to identify different species of bats. Two of the KZN dwarf chameleons (Bradypodion melanocephalum) spotted on a nocturnal survey. In the end we were pleased with the numbers we found over the 3 nights and deemed the population reasonably stable for the area. To my delight one of the most popular surveys were the nocturnal ones on chameleons and frogs. In the end, we found both species of chameleon that are meant to be present in the area, the KZN dwarf chameleon, the flapneck chameleon (Chamaeleo dilepis) and 8 species of frog. The herpetology highlight wasn’t even in one of the “official” field sites though. A keen herpetologist and friend of mine told me about what could possibly be South Africa’s most endangered lizard species. Smiths dwarf burrowing skink or Scelotes inornatus is not just a KwaZulu-Natal endemic species, but a Durban endemic species, not found further inland than 4km. Its entire global distribution is just a sandy strip along the Durban coastline, no more than 30-40km square!! I was incredibly keen and excited at the prospect of finding this little species! Fortunately that the same friend who had told me about it also had a GPS location of where he’d found individuals before. I was joined by a few other keen people, including one of the BioBlitz organisers, an Ezemvelo intern and 3 others from the municipality to go to the GPS point and find this critically endangered lizard. When we arrived at the site to say we were underwhelmed would be a huge understatement. It was a steep slope with concrete steps running down it, between rows of houses in a housing estate! If I was told that one of South Africa’s most endangered reptiles called this spot home not so long ago, I wouldn’t have believed it. Smith’s burrowing skink in appearance isn’t too far off Ireland’s legless lizard, the slow worm. Possibly even a little smaller and more mottled in colouration, it gives birth to live young and spends most of its life burrowing in loose sandy soils along the Durban coast. Besides that, there isn’t much else known about the little creature. So even though the “field site” didn’t resemble anything like a field site, we preceded with our search, lightly digging through the top soil vegetation and roots, flipping over debris and rocks in the hope of finding some. We were over half way down the steps when I was getting the dreading sense that we weren’t going to find any and everyone was wondering why Cormac decided to bring them to a housing estate on a wild goose chase? Till finally!!! A colleague from the plant-insect interactions flipped over an old concrete fence post to find not 1, but 4 little Smith’s dwarf burrowing skinks!! To think that a vertebrate more critically endangered than the panda would be found in this little patch of disused land in a housing estate in Durban city, is shocking to say the least. More endangered than the panda; the urban survivor and one of Southern African’s most endangered reptiles Smiths dwarf burrowing skink (Scelotes inornatus). Again after finding this species, the value of regular BioBlitz’s and working with different sectors and organisations was shown. The three municipality people lucky enough to be with us during the find got to photograph the species. Everyone was in agreement that the municipality should start a local awareness campaign about the little legless lizard. Local residents need to be shown that what they have in their back gardens is so uniquely precious and endangered. Local support and involvement is key to protecting its minute population. I could not recommend more, that anyone reading this should get out there and take part in their local BioBlitz. It’s simply a matter of a quick Google search of when and where your next local survey is happening. I am personally counting down the days until the next two! Bioweb.ie is now on Facebook and Twitter! Follow our pages for updates on all future articles.